Gemini Bulevar tiles that are versatile to boot. 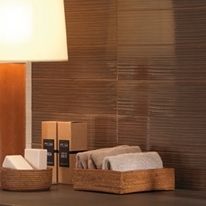 Wall tiles with a modern twist - 400x100mm look great in kitchens and in bathrooms. Create fun colour-ways from the brighter colours of purple, pistachio and rojo (red) and tone with the 5 traditional colours in the range for an eye-catching effect.